In 1999, when retired Capt. Bob Rasmussen’s son, then-Lt. Cmdr. Eric Rasmussen, came home from a deployment, someone snapped a picture of the family reunion: Two young daughters rushing to meet Dad, with Mom holding an even younger son. “That would be something to preserve forever,” Bob Rasmussen remembers thinking. From left, Capt. Eric Rasmussen, daughters Avery and Emily, son Jack and wife Ashley stand behind “Homecoming” during the sculpture’s unveiling last month (click for larger image). And if you need something preserved forever, there are few better people to ask than Rasmussen: Noted sculptor and director of the National Naval Aviation Museum in Pensacola, Fla. He filed the idea away for years. 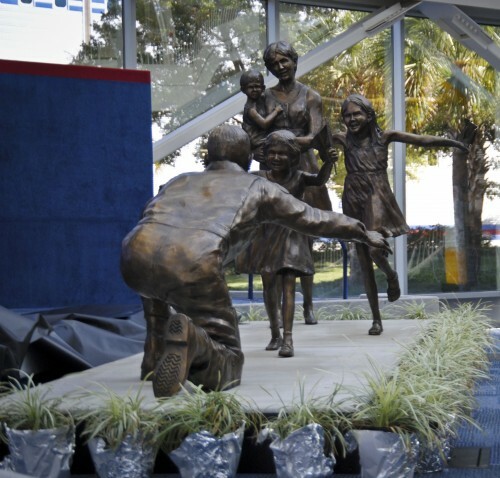 About 18 months ago, he started sculpting “Homecoming,” a life-sized bronze piece depicting the scene in the photo. It was unveiled last month at the museum. Rasmussen donated his time to the project. Funds for the bronze, about $40,000 or so, came from a bequest to the museum from former volunteer Marlin Overholt, Rasmussen said. 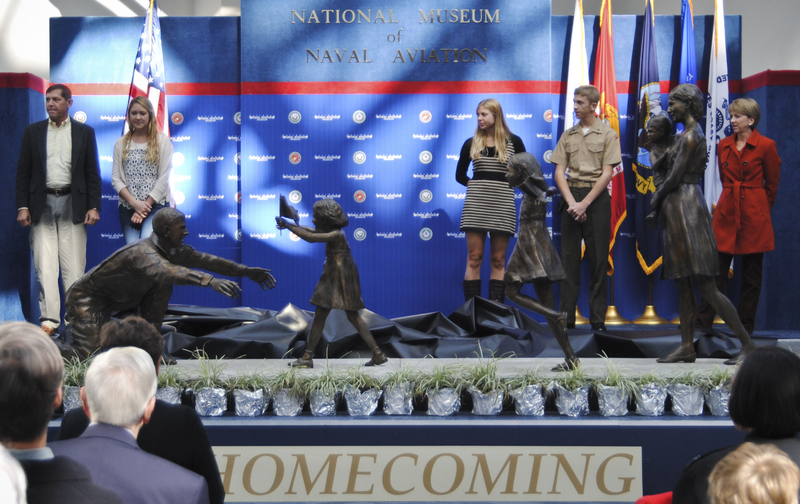 The Rasmussen clan attended the unveiling; the sculpture”s permanent home will be outside the museum, along the walkway between the main building and the museum’s Hangar Bay One.